How to get new English words in the dictionary? One of the most important conditions for a full English language is rich in vocabulary. All natural: the more words you know and know how to use the more difficult, richer and more beautiful than your speech. In life, we operate not so much the words as it might seem. But we know a lot more ideas, so we can read, write and understand speech at the hearing. Dictionaries contain hundreds of thousands of words. We know only a few thousand. For example, the vocabulary of a native speaker is 20-30 thousand words. And the man for whom English is a second, even less. But this is enough for full communion. While seek to expand the vocabulary is still needed. The only question is that it is taught in the first place. After some words lose their relevance with time, but some gain enormous popularity. In addition, every 98 minutes in the world there is a new English word. Not all fixed in the language, but this process, I’m afraid will be endless. Have you ever wondered how to get the new words in the dictionary and become an integral part of the language? It’s not a quick process. It involved a lot of people. On what basis are chosen words? How long it should last for a word to be included in the dictionary? Let’s look for answers to these questions, drawing on the experience of the two giants in the world of English — Oxford Online Dictionary and Merriam-Webster Dictionary. One of the largest and most ambitious program to study the language belongs to Oxford University Press Oxford University Press. The main resources are the Oxford English Corpus and the Oxford Reading Programme. The first source contains a large number of texts collected on the internet, and the second — the electronic collection of offers or small piece of text completely different styles: from the lyrics to the materials from scientific journals. The employees of the publishing house constantly monitor these two resources for the presence of new words. If they see that a new word or term appears often in completely different contexts, the concept becomes a candidate for addition of any of the Oxford Dictionary. As a result, it chooses the words that are considered the most significant and important, which will remain in the language for a long time. In the past, in printed dictionaries to add words that have been used over the past two to three years. In this era of digital technology has changed. A new word can gain wide popularity and find widespread use much faster. And people expect that these new words to be included in the dictionary. Therefore, prior to the compilers of dictionaries it faces a difficult task — to determine which term will be short-lived, and which will remain in the language on a regular basis. By the way, people will often send lexicographers words they have come up with a proposal to add to the dictionary. Unfortunately, in this case, employees of the publishing house have to deny their request. Still, the criteria for selection of words for dictionaries are immutable. 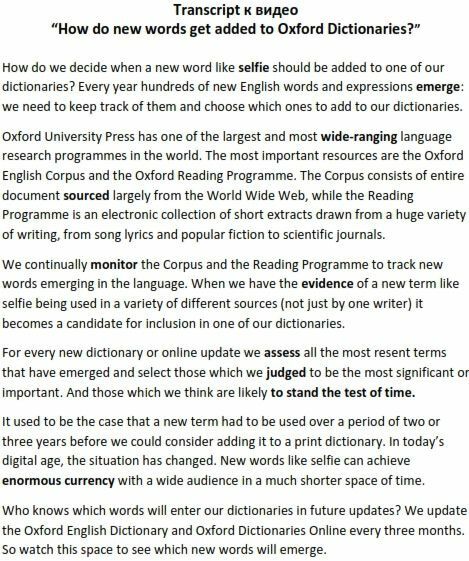 Let’s see the video Oxford Dictionaries in English, in which they will talk in detail about everything mentioned above. 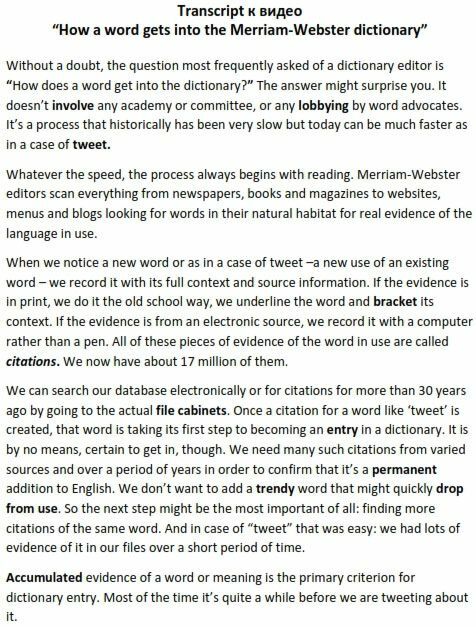 Editors dictionary Merriam-Webster Dictionary work in a similar way. They carefully studied modern English on the basis of a large number of wide range of information. Every day for an hour or two editors read the published material, including books, newspapers, magazines and electronic publications. In the office, they call this activity «reading and marking». The goal — to identify new words, new uses for existing words, spellings, acronyms and abbreviations appearing. Every interesting word stands out, along with the context in which it was eating. Dedicated part of the context, called citations (references), are stored in a database on your computer, if they were found in the publications in digital format. Citations are called even small strips of paper that say new words in print. Now based Merriam-Webster holds about 15.7 million examples of words in context, that relate to all aspects of the English language. In the next stage of reviewing editors appeared citations. Before you add a word to the dictionary, you must make sure that this concept has a sufficient number of references, demonstrating its spread. But that’s not all. The point is not the amount of citations, but the fact that this word is not in the same context on a single resource. For example, the word of the specialized literature, which is slang for people of a certain profession. The word must be used many times in a totally different fields of activity, and hence the different areas of the English language. Moreover, there is a new word must be a significant period of time. Number references keywords is not limited and may vary. It happens that the word appears, gets instantaneous distribution and remain permanently in the language, and therefore, quickly gets into the dictionary. It happened with the term AIDS (AIDS) in the 80s. The size and type of vocabulary is also important, if we are talking about the number of mentions of a word before adding it in the dictionary. For example, in Merriam-Webster’s Collegiate® Dictionary, which limited the number of words, add only the most popular and common words, the significance of which is supported by a large number of citations. But the dictionary Webster’s Third New International Dictionary, and may include the words with fewer mentions, as it has more space.